It is an important time for children in New Jersey. This November we will be deciding on our next governor, who will set the agenda for the next four years. Candidates need to know NOW that we stand for children. This election is taking place against the backdrop of turmoil in Washington. Critical federal programs for children are at risk. NJ is one of two states that will elect a new governor this year. What happens here will have impact on federal policy, too. Your advocacy is more important than ever. Join us and learn what you can do to advocate for kids in this election. Candidates for governor and lieutenant governor have been invited to share their agenda for kids. Bruce Lesley, President of First Focus, which advocates to make kids a priority on the federal level, will discuss the landscape in D.C. and the potential impact on NJ. 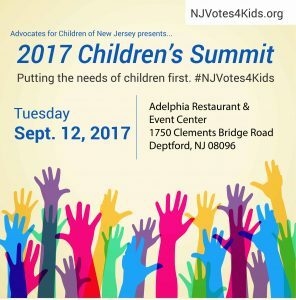 A panel of political insiders will talk about the challenges and strategies in elevating children’s issues in the election and beyond. You will receive ACNJ’s voter’s guide and other information to help you advocate.